Mansfield Town supporters will get their first chance to glimpse some or all of boss Steve Evans’ new January window signings at home when struggling Crewe Alexandra are in town on Saturday for the first time in over 14 years. Crewe, who have only won twice in 20 matches, provide new-look Stags with a perfect chance to show their prowess and end their unwanted record of not yet having scored at home in a first half all season. Evans began the January revolving door last weekend when he allowed Adi Yussuf, Alex Iacovitti, Darius Henderson and Oscar Gobern to leave the club and signed Yoann Arquin, Joel Byrom, Ben Whiteman and Jake Kean, the latter pair on loan. With cash offers in for two more players and enquiries on other loans, Evans admitted more players will be going out still and he proved last weekend he is not frightened to simply throw them in at the deep end as he gave all four debuts in the excellent 1-0 win at Blackpool. That was a first League win in six outings and much needed. Stags drew 1-1 at Crewe back in October in the first meeting of the campaign. The 2002/03 season, when the sides had last met before this season, saw Crewe beat Stags twice in the League, once in the FA Cup and once in the Football League Trophy, and Stags lost them all without scoring. The League games were lost 2-0 at Crewe and 5-0 at home with a 3-0 defeat at Crewe in the FA Cup and a 4-0 home loss at home in the Trophy. It is unlikely Crewe will bring in a new face before Saturday but boss Steve Davis told the club’s official website: “We cannot hang around in January. “We have to act quickly and try to get one or two in. It will depend on a lot of factors. On Monday Crewe battled out a tight 0-0 draw at Morecambe. With the new faces, Stags have an absolute wealth of players to choose from. At Blackpool Evans went with a 4-4-2 formation and, needing a win against a poor side, may stick with that on Saturday. The only doubt would be over centre half Kyle Howkins, whose loan from West Brom ended on Monday and the two clubs and player were due to discuss his future this week. More team news will be given at the club’s weekly press conference tomorrow. POSSIBLE STAGS STARTING XI Kean, Bennett, Pearce, Collins, Benning; Whiteman, Clements, Byrom, Hamilton; Arquin, Green. Ryan Lowe, now 38, is captain and top scorer this season with eight goals and has missed the last three games with a hamstring injury. He should be available again this weekend for the trip to One Call Stadium, though in his absence Crewe have been trying a new 4-2-3-1 formation and it is unlikely he would be recalled to play a lone striker role. Garratt, Turton, Davis, Guthrie, Bakayogo, Kiwomya, Jones, Bingham, Cooper, Dagnall, Kirk. Too often Crewe are relying on the precocious talents of wide man George Cooper. Left-footed, the talented 20-year-old has spent more games wide on the right but been back on his more natural left side in recent games. Cooper is creative, has scored six goals, and too often recently it has felt like him or nothing for the fans. He is a free kick specialist and scored a fine direct free kick against high-flying Carlisle United on Boxing Day. Cooper is an excellent prospect and definitely Crewe’s main man at the minute. Mansfield will also need to keep an eye on Alex Kiwomya, who is on loan from Chelsea. The 20-year-old nephew of Chris Kiwomya of Arsenal, QPR and Ipswich fame, he is lightning fast and has netted seven times so far. He usually plays on the opposite flank to Cooper and, though has not been able to find his form recently, he has the ability to star on his day. Pressure is mounting on Crewe Alexandra boss Steve Davis ahead of Saturday’s game. 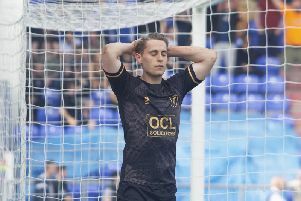 Having survived the summer, despite being relegated from League One, Davis has now seen a promising start to the season go into freefall as the Railwaymen have won just twice in their last 20 games in all competitions. For now the board are sticking by Davis and are making plans to help him bolster the squad this month. But supporters are getting agitated and doubtless the board’s patience will also run out soon too if results don’t improve. Indeed, Crewe only won nine games out of 53 in all competitions in 2016. Pre-season expectations were of getting at least a spot in the play-offs, and that looked a strong possibility when they sat third after the first 10 games with good results in the cups as well. An almost unchanged side during that period helped the stability too. That rhythm was upset by a couple of injuries as the squad’s lack of any real depth was suddenly underlined and, consequently, the side began to also suffer the inevitable loss of confidence as results went against them. With only youngsters on the bench, too many out-of-form senior players are not under enough pressure for their shirts. Striker Pat Hoban opened his account for the club as Mansfield’s search for a long-awaited win continued almost three months ago. However, Chris Dagnall kept Crewe’s unbeaten home start to the season going by cancelling out Hoban’s header as the Stags’ agonising wait for victory extended to seven games. It had been the club’s first meeting in almost 14 years. Don’t forget to read the match report at www.chad.co.uk after the game. Stay in touch with all things Mansfield Town via our new Chad Mansfield Town facebook page – simply click HERE and give us a like to subscribe.